Back Office Pro (BOP) has over a decade of experience in providing outsourcing support for ePUB and ePUB3 conversions. We accept all source formats including RTF, Quark, MS Word, PDF, XML, HTML and assist publishers in converting them into required eBook formats. 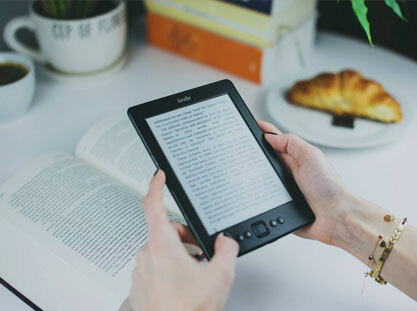 We adhere to the standards set by the International Digital Publishing Forum (IDPF) and boast compatibility across Kobo, Amazon, Barnes and Noble, Apple Books, Google Books, and many other platforms. Our experience covers almost every industry, including publishers, educational institutions, libraries, tech companies, and many others. Outsourcing E-Pub conversion to Back Office Pro gives you direct access to an experienced, dynamically scalable team boosting productivity and shortening turnaround times, as required. Reach out to BOP using the contact form on our website to get your ePub conversion project up and running. Capability to convert children’s books, STM books, educational and academic titles, cooking books, photography books, and many more. CSS and coding expertise for the effective conversion, management, and manipulation of pictures, tables, illustrations, columned text, and other advanced features. Working knowledge of enhanced content from audio and video to interactive and read-aloud books. Well-versed in every type of conversion of any file format including PDF, InDesign, HTML, Quark, XML, hard copies, and any other formats available. ePub conversion capability of any kind, including creating & validating ePub packages, reflowable ePub formats, image and table manipulation, fixed layouts, and more. In-depth experience and a wide range of competencies, enabling the creation, processing, and conversion of graphics, cover and page designs, images, typography, photos, illustrations, and vector art. Printed Books to ePub Back Office Pro has the experience and technology required to convert printed hard copy books into ePub format. We make use of high-resolution scanning, OCR, proofreading, and optimizations to enhance usability. Reflowable We understand how to optimize reflowable formats to ensure full cross-device compatibility. The user experience improves dramatically with the use of reflowable text, giving them access to font size, margin size, line spacing, and other controls. Fixed Layouts Our team works with eBooks containing images, illustrations, and additions. These are best suited to fixed layout designs, allowing the relevant images to appear in the optimal space. We analyze your page layout and optimize the ePub layout using CSS. Read Aloud Users who require enhanced accessibility and those who dislike page-turning often make use of read-aloud enabled eBooks. These allow for hands-free enjoyment of written works. ePub Covers We understand the design process and requirements related to cover design. We ensure that cover art is included in each ePub file, whether newly created or adapted from source. Image Editing Our team makes use of high-resolution scanning, editing, and resizing tools to enhance graphics and insert them into the ePub. We ensure that there is minimal loss of detail, contrast, and depth. Table of Contents We create comprehensive content tables with page links, an intelligent structure, and correct page numbers. Pagination Typically, ePubs make use of reflowable text that adapts to individual screen sizes and settings. This effect makes it possible to view these eBooks across multiple devices regardless of screen size. When necessary, we can paginate content to ensure consistency, as well as readability across required devices. Additions Our team enables the addition of references, endnotes, and citations, along with other page and content enhancements. We enable these functions across all formats and layouts to ensure total readability and immersion. Experience Our team boasts over a decade of in-depth ePub conversion services experience, having operated across multiple industries internationally. Large Projects Our team is capable of efficiently handling large volume projects and adapt dynamically to changing needs. We scale our team up or down to offer optimal support and value for money throughout the lifetime of your projects. Specialization We work fast, delivering outputs on time, every time - with the lowest number of iterations possible. We adapt our processes and approach to match your internal structure and requirements. Communication We assign a dedicated Project Manager to every project to ensure total transparency while driving productivity and monitoring the quality of completed work. You have full access to your project at all times. Manual Checking Compact, accurate information is key to the success of an eBook. Our formatting capabilities ensure the best representations of data, images, charts, tables, graphs, headers, and footnotes. We manually check every aspect of our outputs. Inter-platform Adaptability Back Office Pro works with all types of platforms, layouts, and enhancements to deliver a seamless experience across tablets, smartphones, and dedicated readers. Privacy & Security ack Office Pro adheres to the strictest ISO standards for international data security and privacy assurance. Our internal protocols, encryption capabilities, and elite team members ensure consistent data protection. Cost Saving Our team makes it possible to publish and enhance ebooks at the best possible rate, enabling our clients to embrace the eBook culture and improve their user experience. Back Office Pro offers industry-leading e-Pub conversions, including all the most up-to-date editing, formatting, and enhancement techniques and technology. We ensure complete translatability of content, images, tables, illustrations, and a host of other key additions. With over a decade of experience and total flexibility, we enable your business to bolster the strength, productivity, and turnaround times offered by your own internal teams. Our support is fully scalable, creating an environment conducive to improvement and growth. Contact us with your project requirement and one of our business development managers will assist you in how to get it started.